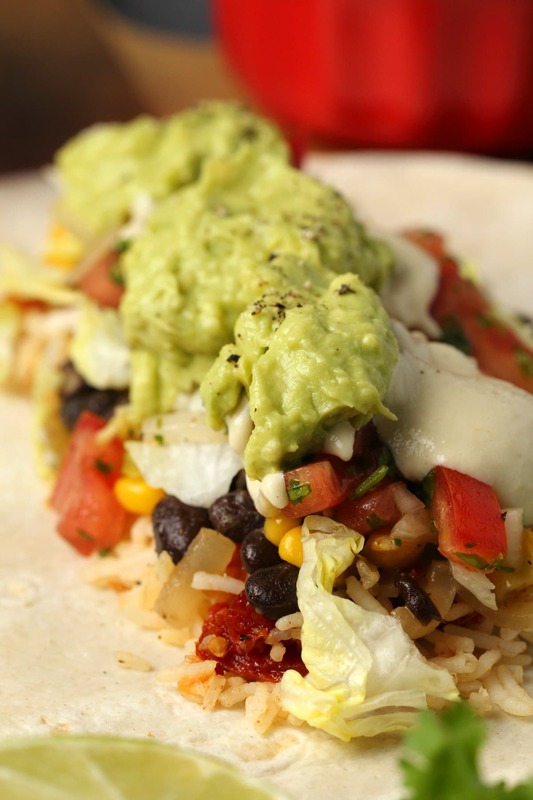 A vegan burrito that is filling, hearty, flavorful and every kind of delicious! Stuffed with black beans and corn, rice, vegan sour cream & guacamole. 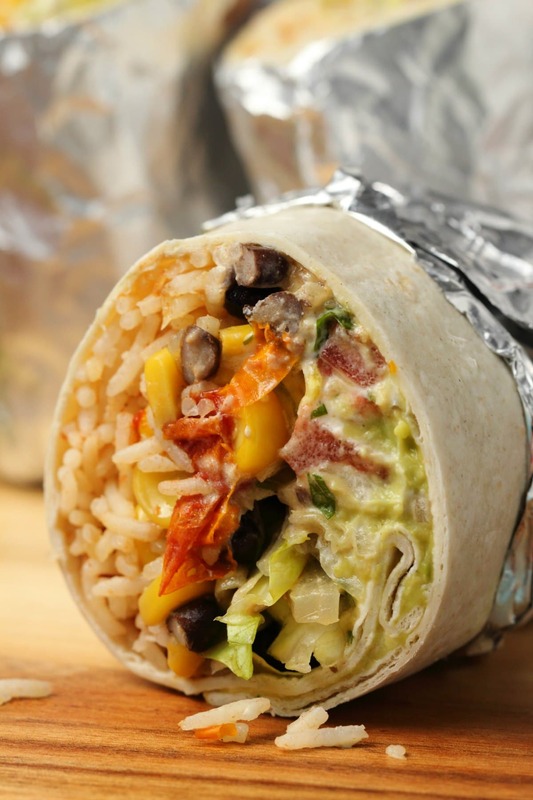 Is anything more delicious than a vegan burrito? Not many things I tell you! 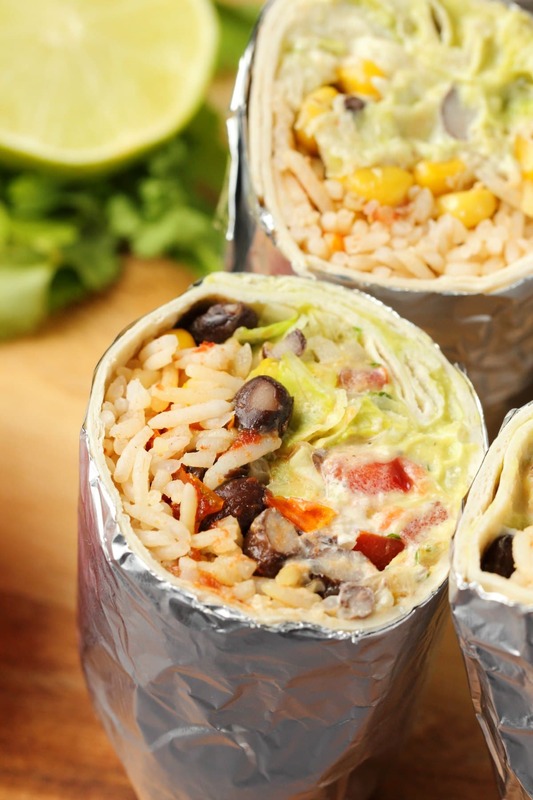 These delicious black bean and corn vegan burritos are everything. They have so much flavor and texture going on, it’s just like happiness in your mouth (and tummy). When we lived in Dubai there was a burrito shop right near the skate park and Jaye is big into skateboarding. That’s how much I love a good vegan burrito. And these homemade ones are just as good. Now I’ll be honest, it’s not the fastest thing you’ve ever made. There are a few elements involved, you don’t have to do everything, but the more elements you add, the more delicious your burritos will be! It’s ideal if you can get someone else involved to help with the prep. There’s nothing difficult that has to happen here, but just a few moving parts. You make some vegan sour cream, shred some lettuce, make a pico de gallo salsa, cook some rice and then mix the cooked rice with some chopped sundried tomatoes, a little fresh lime juice and some salt and pepper, make your black bean and corn mix and your guacamole. Like I said, you don’t have to do everything, if there is something you’ve bought ready-made or something you can’t really be bothered to make, you can leave it off! But the real delighting your tastebuds comes from the full monty here. So if you can split these tasks up between a couple of people, put some music on and pour some wine, you can have a fun time of it. Even if there is just one of you doing all of it, you can get it all done in around an hour. But it’ll be more fun if you can get a buddy on board. You want to place the filling in the center of the tortilla and then fold in the sides and then roll it up! A picture is worth a thousand words though so I did find this 23 second video on youtube that is really just a super simple way to demonstrate how to do it. I don’t think this is a vegan burrito that they’re rolling, but we’ll just pretend that’s vegan cheese on it. This next video is a bit longer (but only 1 minute) and has some extra tips on getting the perfect rolling technique for rolling your burrito and I think this one IS a vegan burrito – yay! So watch that one as well and you’ll be all set. 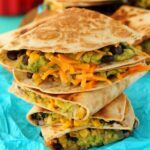 Can I make these vegan burritos gluten-free? Yes! 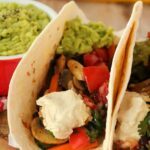 You can use a gluten-free tortilla for the wraps if you prefer. Everything else in this recipe is already naturally gluten-free. 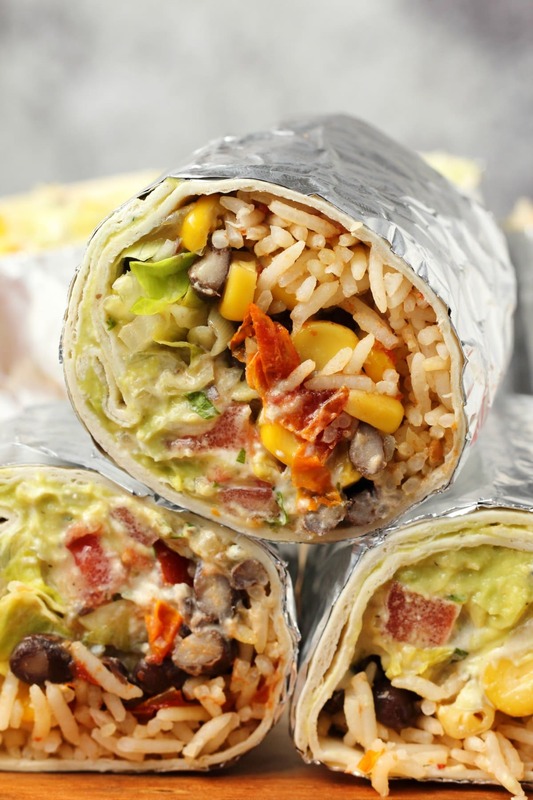 You can make up more burritos than you’ll eat right away and keep the remaining burritos in the fridge and have them the next day. Usually I would say guacamole is not a great thing to keep overnight, but wrapped up in a burrito that is then wrapped up in foil and kept in the fridge overnight, it lasts just fine. We did this and had leftover burritos for lunch the next day and they held up perfectly in the fridge overnight. I wouldn’t keep them for longer than that though. Hmmm, if you want to freeze these, then don’t add in super fresh ingredients like shredded lettuce and pico de gallo as those don’t freeze well. You could use shredded cabbage instead of lettuce if you wanted to as that does freeze well. 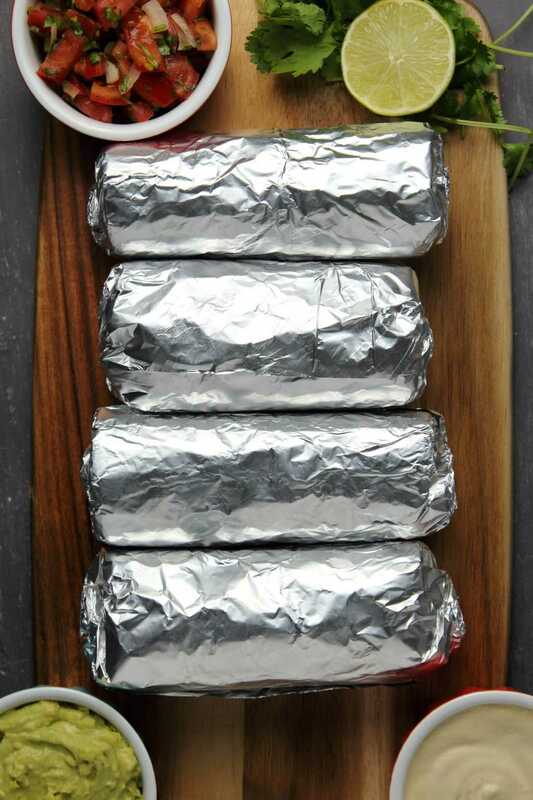 Wrap them in foil before freezing and then place into an airtight container or freezer bag. When you’re ready to eat them let them thaw in the fridge for 24 hours and then reheat in the oven at 350°F (180°C) for 30-40 minutes until warmed through. This does make a big batch of burritos, 8 large vegan burritos. So either make this when you have enough people who will eat them over a day or two at the most, or scale the recipe down. 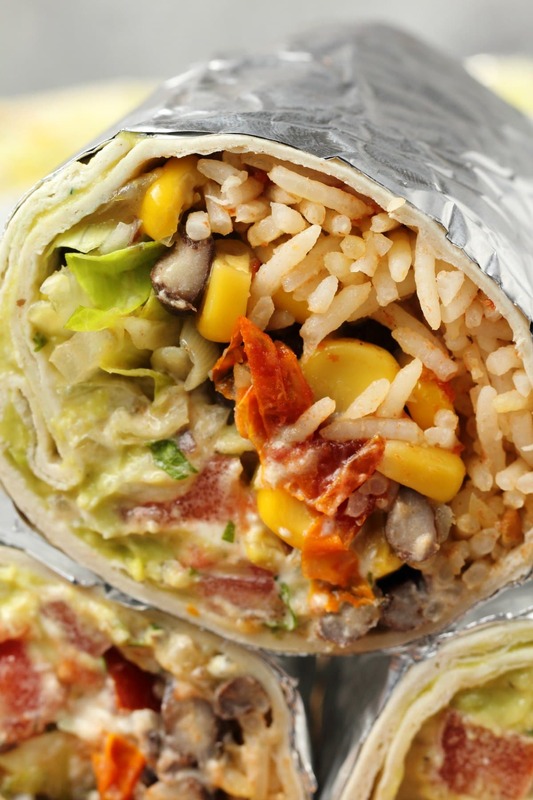 Keep leftover burritos wrapped and stored in the fridge overnight and enjoy the next day. See notes above for more storage and freezing instructions. 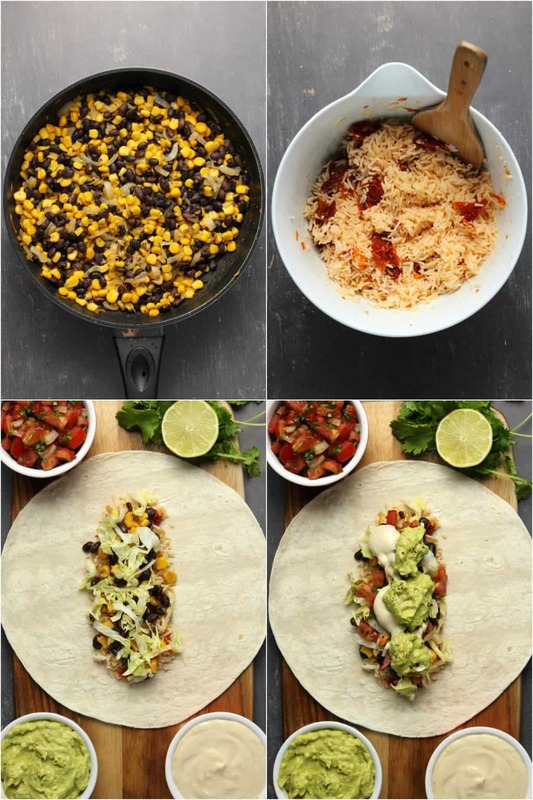 Let us know in the comments what you think of this vegan burrito recipe and please do rate the recipe too, it’s super helpful. 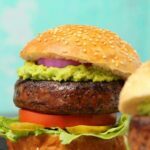 And while you’re here, sign up to our email list, you’ll get an awesome free recipe ebook containing 10 delicious vegan dinner recipes and you’ll be the first to know when new recipes are posted to the blog. 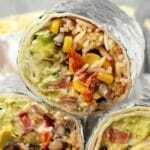 A vegan burrito recipe that is filling, hearty, flavorful and every kind of delicious! 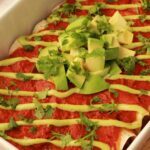 Stuffed with black beans and corn, rice, vegan sour cream and guacamole, this is a recipe you’ll return to again and again. Prepare your black beans and corn mix. Add the chopped onion and olive oil to a frying pan along with the cayenne pepper, dried chili flakes and cumin and sauté until the onions are softened. Add in the black beans and sweet corn along with the water and stir fry until most of the water has cooked off. Add salt and pepper to taste. Leave to cool while you prepare the other ingredients. Prepare your sundried tomato basmati rice. Add the cooked rice to a bowl and then add in the chopped sundried tomatoes and lime juice and toss until well mixed in. Add sea salt and black pepper to taste. Set aside. Prepare the salsa and sour cream. Prepare the pico de gallo salsa and vegan sour cream as per linked recipes and set aside. Prepare the guacamole. Add peeled and chopped avocados to a bowl and mash with a fork. Add in the lime juice and salt and pepper to taste. Prepare your tortillas. Warm your tortillas in the oven (follow package directions) for around 10 minutes wrapped in foil. Assemble. Lie a tortilla down flat on a plate. Add some sundried tomato basmati rice to the center of the tortilla, followed by some black bean and corn mix, followed by some shredded lettuce. Then add some pico de gallo then some vegan sour cream and top with guacamole. Fold in the sides and then roll it up and wrap in foil. Continue with the next tortilla. Serve. 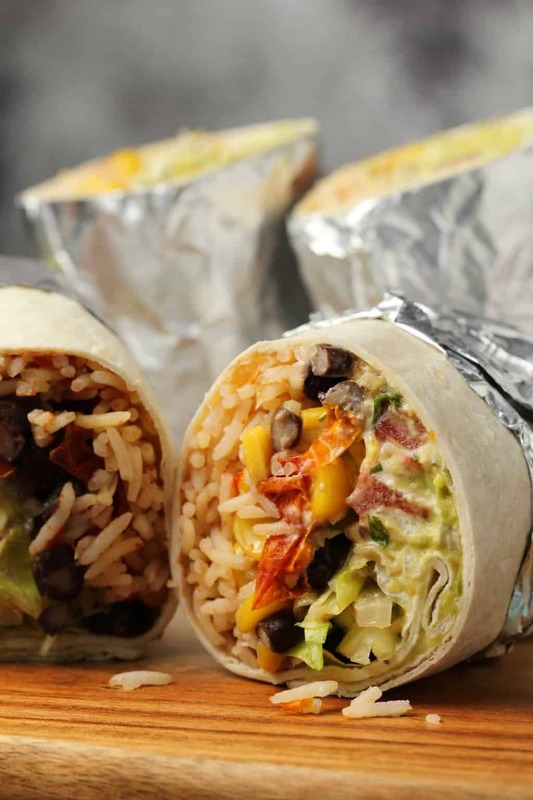 Cut the burritos in half and serve. 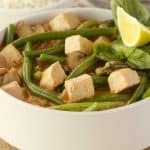 *We used basmati rice but brown rice would also work great here. Basmati is really quick to cook so that made our decision for us! 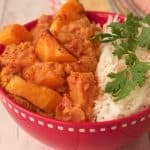 Add 1 cup of uncooked basmati rice (200g) plus 1 and 1/2 cups of water to a pot, bring to the boil, cover and simmer until the water has been absorbed. This equals almost exactly 3 cups of cooked basmati rice. 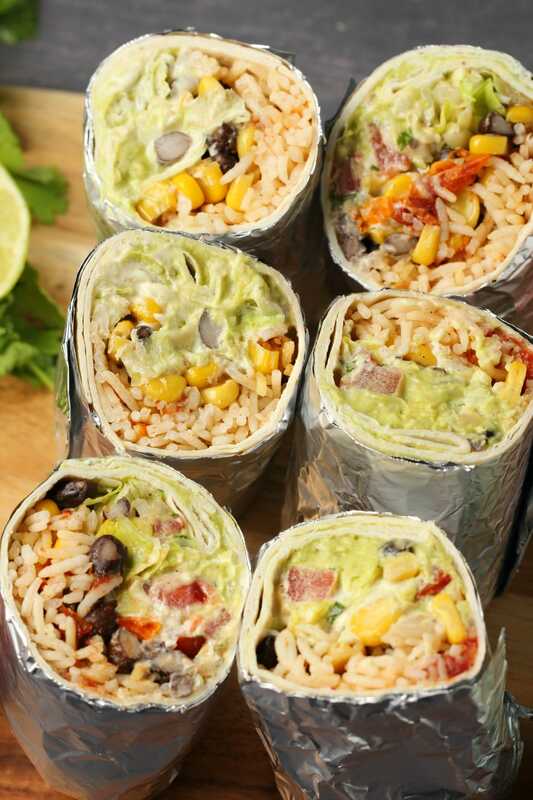 *Nutritional information is for 1 burrito (of 8) with an even share of everything in it, rice, beans and corn, lettuce, pico de gallo, vegan sour cream and guacamole. We made these yesterday! Oh my word they were so delicious. The whole family loved them. Thanks. Hi Tammy, so firstly you want to avoid the ingredients that don’t freeze well (like lettuce and the pico de gallo). You could use shredded cabbage instead of lettuce if you want to as that does freeze well. You would wrap them in foil before freezing and then put them in an airtight container. When you’re ready to eat them let them thaw in the fridge for 24 hours and then reheat in the oven at 350°F (180°C) for 30-40 minutes until warmed through. Improve the flavor of the shells by putting a bit of oil on a hot pan/griddle toss on burrito shell toast a minute or two to get little browning going on.